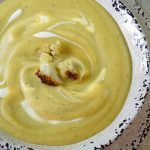 Cream of Cauliflower Soup Recipe is rich and velvety. It's a delicious guilt-free comfort food meal. This soup is super savory, using just a few ingredients and on the table in only 30 minutes.